THIS ADMINISTRATION’S ISLAM POLICY IS TOTALLY FLAWED…. Barack Obama is either “ignorant”, in “denial”, or blatantly engaged in a “conspiratorial coalition” regarding Islam or all three. I have not fully decided what I think on that front but I know the current politically correct way of dealing with Islam is putting the United States of America and Americans, if not the entire world in “grave danger.” It is a disaster waiting to happen and anyone who believes that “making apologetic speeches”, kowtowing to the wishes of Islamic interests, or forcing everyone in America and other parts of the world to appease them will produce positive results is “smoking something illegal.” That is a very flawed mentality because they are not driven by what we do as much as they are by what they believe. Dr. Gabriel in “Islam and Terrorism” quoted Mawlana Abul Ala Mawudi – “Muslim nations are very special because they have a command from Allah to rule the entire world and be over every nation of the world.” Does that sound like a passive, moderate, tolerant people or religion? HARDLY! The Jihadists’ have an unshakable commitment and desire to “rule the world” and believe that it is a direct command via their prophet from Allah, so nothing we do will shake that commitment. They view us as the “prime target” for their assault because the fully believe, and rightly so, that if they can topple America they can topple the rest of the world with little difficulty. The economic impact of a toppled America means little to them because they would either live in the caves of Pakistan and Afghanistan or live lives of meager sustenance believing that they had done god a service in destroying us. Therefore, hardship for them would be meaningless. Some have suggested that they would never engage in a total assault on the U.S.A. because to do so with “nukes” would kill fellow Muslims but remember there were Muslims in the Twin Towers on 9/11 and per their Koran it is okay to kill other Muslims if they are living in the land of the infidel. Their mentality is warped by their religious beliefs and have a deeper commitment to their core beliefs than most Christians in the U.S.A. exhibit for their cause. It is far deeper and more radical than most believe and by saying what I have and will I will be called an Islamaphobe and I really don’t care, I have a warning that is valid and must be issued. Both are to be religious and governmental leaders, who lead military campaigns, in an attempt to conquer the nations of the earth, and usher in a new world order. Both will lead the world to worship them in a universal world religion. Those who don’t worship the new world religious leader will be decapitated. Both will seek to kill as many Jews and Christians as possible. Both will change the laws and the times (calendars). Both will make a peace treaty with Israel for seven years. Both will go to Jerusalem – The Antichrist will rule from Israel’s Temple and the Muslim Mahdi will establish Islamic Caliphate from the Temple Mount. For Mr. Obama to continually declare that the United States is “not at war with Islam and will never be” falls on deaf ears because they don’t care. They are at war with us and view his statements as weakness on the part of America and her people. It doesn’t matter if they view him as one of them or not, it is you and I that they view as weak because there was not a protest from Congress or the People that stopped him. After all he is now in his 2nd term and that screams to the Muslim world that we are weak. They are preparing to rule the world and killing Americans is one of their top priorities. That is why we MUST stop this insanity of tiptoeing around the truth about Islamic Terrorism and take steps to deal with it and deal with it proactively. Almost forty years ago, I told numerous congregations that the only way I saw for the Book of Revelation to become reality was for the United States and the Soviet Union to cease to be superpowers. The Soviet Union is no more, although Russia exists but not with the same might as her former self and I know in my heart from my study of Scripture that this nation of ours will one day topple. I don’t know if that will be from attack by external forces of if it will be an internal collapse but the hindering force of the United States against a Muslim takeover and implementation of Sharia Law will one day no longer hinder. That being said, I’m not willing to sit idly by and watch it happen. I will use every means available to stand against it. Today, I’m using my 1st Amendment Rights and SPEAKING OUT. What will need to happen down the road, I don’t know but for now I AM SOUNDING THE WARNING! Wake Up America! May God bless you and may God bless America! I lived more than half of the 20th century, growing up during the sexual revolution, and hippies. I am a veteran of the Vietnam War or conflict whichever you choose, for those of us there it was war. I watched the Civil Rights Movement the Kennedy assignation and many other things some good and some not so good in the past century. As the 21st century blossomed on the horizon we had the horrendous events of 9/11, wars in Afghanistan and Iraq not to mention the other conflicts that have erupted around the globe. We’ve seen numerous mass shootings, some from deranged individuals and one at Fort Hood, Texas where a Muslim extremist murdered a host of people and wounded others. Now, we have the latest terrorist act in Boston with the murder of three and the wounding of over 170 others. 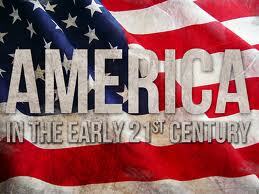 Our world has changed dramatically since I discovered America before the mid-point of the last century. When I was growing up in rural East Texas hardly anyone locked the doors to their homes or the automobiles and there was little concern about theft. Neighbors watched out for each other, knew each other, and helped each other unlike today where people live in communities and barely know their next door neighbors much less watch out for them and help them. In the public schools that we attended the teachers were able to administer corporal punishment and if they called the parents about an issue the parents did not automatically take a defensive posture against the school and threaten lawsuits. Truthfully, if disciplined at school I received even more discipline when I got home. My parents informed us that misbehavior would not be tolerated and would be practiced with a severe penalty and I managed to discover first hand that they meant it. We grew up poor by most standards but never considered ourselves disadvantaged because of the work ethic and pride of our parents and grandparents. They, as did most, believed that you should earn what you received. I’m not saying that everyone on government subsistence today has no work ethic or pride but many do not. Some have become professional, career welfare recipients and have raised a generation or two of the same and it is destroying this nation and propelling us into a condition that spells doom. Vietnam was not a popular war and I won’t get into the merits or demerits of that war but it happened and in my community in the 60’s to have burned my draft card or dodged the draft would have resulted in my being estranged from my family and ostracized in my community. Patriotism was very high and many in that era had either served in WW II, Korea or both and when the nation called they would not understand refusing to serve. I saw action and had friends wounded and knew people who did not make it home. I realized soon after arriving in country that we were not really there with the commitment on the part of our government to win the war and although that was deeply troubling I continued to do my job as best I could in the interest of staying alive and keeping as many of my fellow warriors alive. I fought because my country asked me to and my fellow members of the armed services needed me to do my job. Today’s mindset is completely different on the part of the public regarding serving in the military and our commitment in various conflicts or wars. Since WWII this nation has not shown the commitment to finish the job and possibly never will and that is a dramatic difference in the second half of the 20th century and is increasing in the 21st century. We live in a very different world. In the 20th century the world either respected or feared America today few respect us and almost no one fears us and that has dramatically increased over the past four years. I thought after 9/11 that we were going to turn the corner as a nation and have the cohesiveness that would be long-lasting and become the America that I grew up in again but just a few years later we have demonstrated that was not to be. 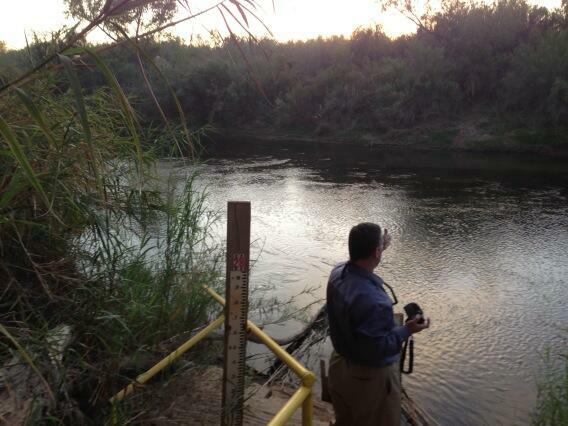 We have a border that is so porous that almost anyone at any time can enter this nation. It is amazing that we have not experienced more terrorism than we have. I realize that the two identified in Boston had lived there for years and were influenced by extremist around the world from all reports. In our 21st century politically correct world one cannot identify the source of terrorism without being labeled as a bigot, racist, or something equally derogatory and hurtful. It is a changed world and on that front, not for the better. It is true that one could live with little fear or apprehension in the early second half of the 20th century that is not the case in 21st century America. We could learn from the U.K., Israel and other parts of the world that have experienced more terrorist activities than we that the public has to become deeply involved in keeping us safe. We have to cease being uninformed, unconcerned, and learn how to become observant. I would prefer to live in a world where I could “mind my own business” and not pay any attention to what other people do but I realize that many in the world are so driven by radical ideology and have such a depraved value of human life that I do not have that luxury. In Vietnam I observed everything and took nothing for granted. I’ve worked in various jobs that required me to be vigilant, observant, and attentive at all times and confess that, to some degree, I’ve grown slack in that. That has to change in me and in each of you. If we see something that does not look right we have to pay attention, it might mean our lives or the lives of countless others if we fail or allow apathy to prevail. I do not want my Constitutional rights, freedoms, and liberties or yours infringed and am not suggesting that the government take them in the name of safety. What I am suggesting is that we observe and respond accordingly. We cannot prevent every act of evil that people want to inflict but we can, as citizens, prevent some of them by heightening our state of awareness and hone our skills of observation. As a hunter I know the importance of being aware of my surroundings and noticing things that are out of the ordinary and change. For years, it has been second nature for me to walk into a room and take mental note of the people in that room and I notice changes. My wife and I visited New York City just prior to 9/11 and were in the 2nd Tower just a few days before the attack and it is indelibly imprinted upon our hearts and minds what we saw then and afterward. As we walked the streets of Manhattan I repositioned my wife several times based on what I observed and she learned not to question me because on one of those occasions the person I moved her away from stole the purse of a woman a few feet behind us. Today it is not uncommon to hear of drive by shootings, muggings, murders, rapes, and assaults in broad daylight. We live in a dangerous world that is sinking lower and lower into depravity. We MUST individually, take steps to protect ourselves and those around us and whenever necessary alert law enforcement of potential or real danger. Burying our heads in the sand and saying “it’s none of my business”, in this day, could result in grave harm coming to those we love or those we could help protect. There is a thin line between infringing upon your rights and protecting mine and I am constantly seeking to find that line. So I encourage each of you to be prayerful, observant, vigilant, and willing to speak up and speak out when you feel it is necessary and appropriate. BORDER SECURITY – NOT UNDER OBAMA EVER…..
As long as Barack Obama is in power and the Democrats have control of the Senate and there are a significant number of RINOs in both houses we will NEVER have Border Security. They don’t want it, don’t see the need, and have no clue how to fix the problem. Those in Washington that do are muzzled as often as possible and marginalized by fellow members of Congress and the press to the point that a significant portion of the public considers them nuts or extremist that should be dismissed. That is a sad state of affairs. The report by Representative Jason Chaffetz (R-Utah) that was on The Blaze on the 3rd presents a picture of the problem and how our government is aiding and abetting the influx of “illegal aliens” into this nation. I do not believe it is just through ineptness because I am convinced if they took the muzzle off the Border Patrol and Law Enforcement agents with the Justice Department truly enforcing the Laws we now have we could solve the border problem. I want to include some pictures that the Congressman posted in what I write. 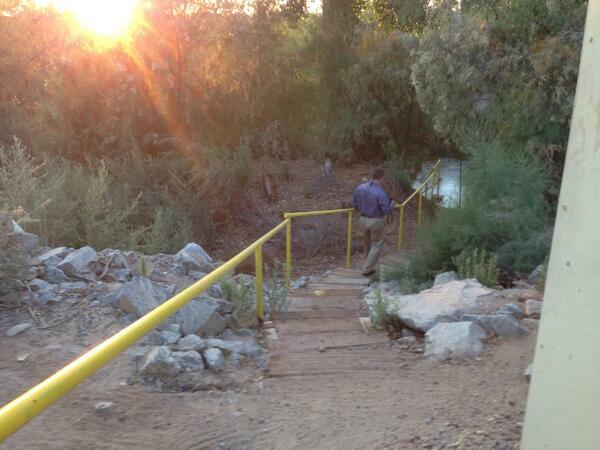 He was in Arizona and visited a portion of the border where there was no fence but a stairway with handrails to enable someone to easily scale the hill that led to the river. The river was shallow enough at that point for a person to walk, not swim or use a boat to cross – just WALK ACROSS and use the nice stairway and handrails. I wonder if there was a sign that said “WELCOME TO THE USA?” I guess not, but there might as well have been. 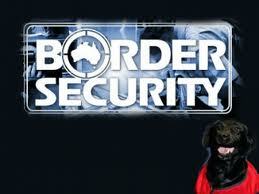 He also reported that the Border Patrol had apprehended Nine (9) Romanians crossing the border. The USA-Mexican border! God only knows who else has crossed and what they brought with them up to and including “nukes”and other “weapons of mass destruction”such as “suitcase bombs” and “dirty nukes.” This is so serious that it should be one of the TOP PRIORITES of every legislator and the President but it is only important to a handful of those holding elected offices in the Nation’s Capital. I find that alarming and appalling and hope that you do as well. The reports are that the “illegal crossings” has doubled since the talk of Amnesty has begun and it seems that Obama and the Democrats do not care and, in fact, seem to like the idea. The estimate is that there are 11million “illegals” in this country but I would suspect that it is closer to 15 million or more and by the time Obama pushes through his Amnesty plan or uses executive fiat to accomplish his goal there will be upwards of 20 million new Democrat Voters in this country. I know that some of them are already voting in our elections and would not be surprised if he somehow made it legal for all of them to vote along with those in the graveyards and those who vote multiple times. The Department of Justice should be renamed the Department of Injustice or Department of No Justice because they are so selective in what laws they enforce that it is alarming. They no longer even appear to make any effort to conceal what they are doing because they see a “toothless” congress and a “listless” citizenry and have no fear. What they are doing and have done is in direct violation of the Constitution and is, in fact, a crime and should receive indictments and prosecution but won’t. While I do not agree with all he said I do agree with some of it especially the first couple of sentences. In America we are in a mode of accommodating everyone and are obsessed with cultural diversity to the point that we are losing American culture. We have millions in this country who do not know our language, have no desire to learn it, and we are passing laws and putting forth regulations that require businesses, etc. to accommodate them. NO! If you want to come here then be committed enough to this nation that you at least learn the language so you can assimilate and be productive. We have gone overboard on accommodation and political correctness and need to pull our heads out of the sand and WAKE UP! Secure the border then let’s talk about what to do about those here “illegally.” Until the border is secure there should be NO TALK ABOUT any pathway to citizenship. Enforce our laws and acknowledge that the very fact that they are here ILLEGALLY is a CRIME. We should not be spending taxpayer dollars on people who are here illegally especially when we have millions of American citizens in economic and medical difficulty. I do not mean to sound heartless and am willing to help anyone who needs help but if you commit a crime why should you be treated as a folk hero and brought to the head of the line and afforded all the rights and privileges of law-abiding people? Contact your elected officials and let them know how you feel regardless of how that is. Exercise your constitutional right while you still have it. May God bless you and may God bless America! IS HOLLYWOOD WARNING OR CONDITIONING US? I know that may sound like a strange question but I’m serious. I have contended for years that if you want to know what is going on in the “spirit realm” watch what comes out of Hollywood. That, I believe, also applies frequently to the political agenda of the Progressive, Liberal, Left-Wingers in Washington. I have had people poo-poo me over that statement about Hollywood but I have watched it carefully and believe that if you do over a period of time you will find that I’m right. I’m not saying that you rely on Hollywood to tell you what is happening in the “spirit realm” or the “political realm” but it can serve as a confirmation or be an indicator of something that you might want to begin watching. Of course, I need to give you an example of what I’m talking about. I have been enthralled over the past few months at movies that are coming out or have come out that involve an overthrow of the United States of America either by outside or inside forces. Movies such as: Red Dawn 11/21/12, Olympus Has Fallen – 03/22/13, G.I. Joe Retaliation – 03-27-13, White House Down – 06/28/13 and other movies such as After Earth – 06-07-13, and Red2 – 07-09-13 all involve some kind of conspiracy. I really don’t think Hollywood is trying to sound the alarm but are trying to condition us so that we will either consider that possibility a mere fantasy or make it appear so impossible to resist that we just accept it when it happens. My Patriotic and Christian antennas go up when I see things like this and then I look at what is happening in the world and government and realize that this is probably not an intentional prophetic warning by Hollywood but it something that is being developed behind the scenes. I have long considered Hollywood as an arm of the devil’s propaganda machine and a very effective one. We have come to the point in history where movie stars believe that they are or should be the spokesmen/women for the leftist agenda and that somehow their fame affords them a higher place on the intelligence scale than the rest of us. The main stream media plays along as do the left-wing politicians and even some of the Republicans who are truly (Republican in name only). We see movies that fan the flames of hatred and bitterness along racial lines in Django Unchained that came out Christmas Day last year. We see massive ammunition purchases by various governmental agencies, some which have zero need for ammunition or firearms, and the Department of Homeland Security has declared that they are buying in such large quantities to reduce the price. I have to ask, “When did government ever care about reducing the price?” They are spend-freaks and money has never been an object when politicians and governmental agencies want something. They see it, they want it, they buy it and all on our nickel. Those of us who have been watching realize that the left has been putting together their “Fundamental Transformation of America” for almost 100 years and it was not until Obama articulated that in his campaign and acceptance speech after his first election that some took notice. The Fabian Socialists have been working with various and sundry other groups for decades to bring about the downfall of Capitalism and a Constitutional America with Liberty and Freedom. They and people like George Soros, Bill Ayers, Saul Alynsky, and Barack Obama have made statements and committed acts that indicate that they do not like this country, its system of government or economic system, and want to turn it into a state in the International Nation of a One World Government. At this point I’m not sure that Obama and his handlers want to use armed force to enslave us but would prefer to slowly and systematically strip us of our rights and freedoms to the point that we have no means of resistance. They are expanding the “welfare rolls” and making more and more people dependent upon the government for their existence. The percentage of people living in poverty is the same as it was in the 60’s and we are supposedly in a grand recovery economically. We have more people on food stamps than ever, more people on disability than ever both numerically and statistically. They are pressing forward with the Amnesty Plan to insure that another few million are locked into the Democrat voting block and insuring that we will move from a two-party system to a ONE PARTY SYSTEM and elections will be a foregone conclusion. At that point, if it happens, they will have the legislative clout to strip us of all our Constitutional Rights and, I believe, will make the move to DISARM PRIVATE CITIZENS for the final takeover. It will be at that point that difficult decisions will have to be made by many who are now on the fence about what to do and where to place their trust. I have made my decision and know that our Founding Fathers saw this kind of danger and warned us of it and believe I know what their reaction would be to this type of Tyrannical assault from within. If we are attacked from the outside it would tend to solidify and unify the nation and I do not believe that is something that Obama and his handlers want so I believe that the powers that be will seek to avoid that. I do believe that they want to systematically take total control from within and the day is coming, and I believe soon, when each of us will have to “count the cost” of Liberty and find ourselves in the same place Patrick Henry found himself and echo his impassioned plea “Give me liberty or give me death.” I pray that we are able to turn the tide before that day comes but I have prepared my heart before God for such a day and am at peace as to the decision I will be called upon to make. I love this nation. I love my God more but I love America and have fought under her banner in combat and will stand for Liberty and Freedom again if called upon to do so. I will continue my tireless endeavor to get the ear of politicians and continue to pray to the Almighty that He move on the hearts of men and women to turn back to right paths and allow America to be spared and restored to her former glory for the good of God’s Kingdom and mankind across the globe. Yet, I realize that judgment may fall on this nation and if it does we all will be affected. I do, however, believe that God will protect and defend those who follow Him with a whole heart no matter what transpires. He will either give us a “Petra-like place for refuge” as He did Israel or a “Cave of Adullam” as with David and his men or He will take us home to glory. Some of us may literally become martyrs for the cause of Freedom and if that happens, it happens. My cry is “WAKE UP AMERICA” perilous times are afoot and if we remain idle the price for us and our children will be great. It is time that we return to right paths and stand firm for Constitutional Liberty.